A short clip from the movie Minority Report – a Tom Cruise classic about a special police unit that arrests murderers before they commit their crimes – was given the HP treatment this week at Reinvent in Houston. Characters were no longer talking about grizzly murders of the near future, but about failing printers seeking repairs or an ink replacement. “They’re out of magenta, can’t you see? !” yelled a woman on screen, prompting an ominous glare from Cruise. Those who were familiar with the movie applauded, but in that moment everyone knew exactly what HP’s priorities were for 2019 and beyond. 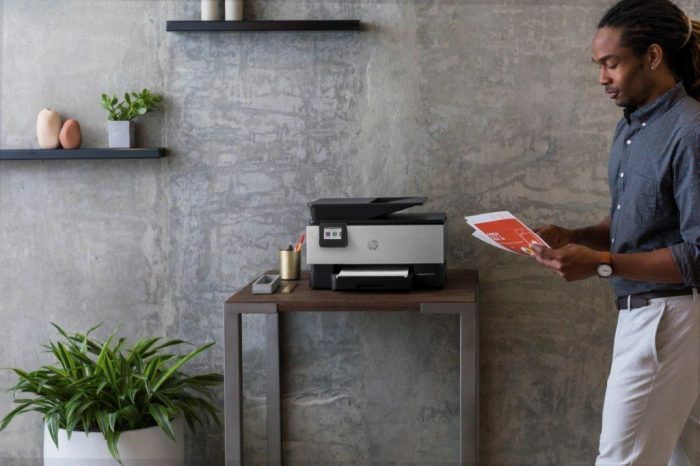 While the hardware giant isn’t shy about talking products, it focused a lot on differentiation this week, encouraging partners to invest in the ability to service the HP products being resold, specifically printers. Most research suggests 90 per cent of companies don’t know how many printers they have or how much they spend on print. SmartPrint Managed Print Services says companies who have implemented MPS have experienced up to 50 per cent reduction in paper and printing costs and a 25 per cent-reduction – or more – in calls to IT. They’ll also likely reduce office printing and imaging vendors from five or more to one. The managed print and document services and basic print services market was $38.4 billion in 2017, and IDC projects that by 2022, it will grow to $49.9 billion. This is partially fueled by the fact that younger workers prefer subscription over ownership . A conversation between HP CEO Dion Weisler and Michael Gross, vice chairman of coworking company WeWork, included several references to millenials and generation Xers and deep dives into how these groups have changed buying habits globally. Managing printers, or any device for that matter, is the last thing on these people’s minds. “But when the printer crashes, it’s a disaster for everyone,” said Gross. HP is responding by doubling down on the innovation of its products with new firmware, rolling out a new financing option for partners, and introducing a new security service to address the surprisingly overseen attack surface growing businesses with significant printer needs still forget about, explained Christoph Ruef, vice-president and general manager of Americas for HP’s printing business. Many clients don’t understand printers are an endpoint on the network, vulnerable to the same threats that target PCs and mobile devices. “We’re working very closely with our PC division. Everything we do on the PC side of the house, we’re bringing those capabilities to our printers,” he said. But making the shift to a transactional business and maintaining a client’s printing needs isn’t easy, said Tran, which is why many of the 1,400 partners in attendance have asked for help in the form of education and training, improved partner portals and more products aimed at small to medium sized businesses. Rob Farrell, vice-president of sales and marketing for SmartPrint Managed Print Services, with president Tim Lomax. Photo by Alex Coop. Toronto’s SmartPrint Managed Print Services certainly has. The 31-year-old-business is well-versed in the MPS space, and is one of the few HP Canada partners with Smart Device Services (SDS) capabilities. The technology combines cloud-based tools and device-embedded sensors to help diagnose and manage service needs across an entire fleet of HP devices. More than half of SmartPrint’s business comes from contracted MPS. The rest is hardware and software to support those accounts, according to Rob Farrell, vice-president of sales and marketing. He said 90 per cent of its business is with HP, and when asked why that number is so high, his answer was the technology’s growing appeal among the businesses with 100-1000 seats, in addition to the tools HP has introduced over time to help SmartPrint manage them. “They’re way ahead compared to everyone else,” said Farrell about HP. 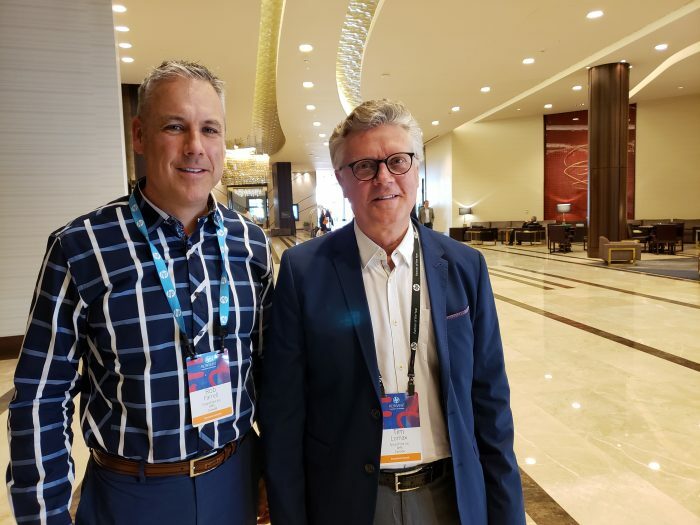 Harry Zarek, president of Compugen, another major player for HP north of the border and SDS connoisseur – and winner of HP Canada’s Personal Systems Partner of the Year – described HP as a hyperactive persona that’s “Not your parent’s HP”. He also praised the vendor’s ongoing focus on Device-as-a-Service (DaaS).